This tutorial provides you with a foundation for working with multiple video tracks in Adobe Premiere Pro. It is the third lesson in the Adobe Premiere Pro CS5 Digital Classroom book. For more Adobe Premiere Pro training options, visit AGI’s Premiere Pro Classes. You can keep all your clips on a single video track, but it might not always be practical. For example, you can easily create a cut-in or cut-away by placing a new clip containing B-roll footage on a track above the one containing an A-roll. Multiple tracks are also useful when you need to place graphics or titles above your video footage, or to compose multiple video clips to create a ghostly effect. 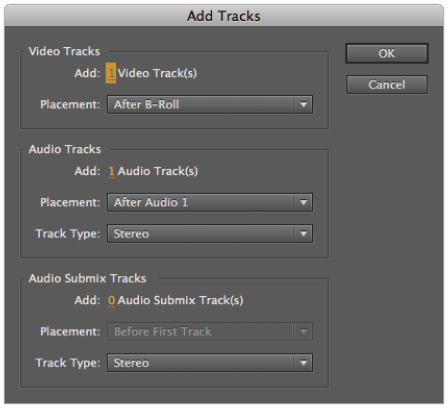 When you create a new sequence in Premiere Pro, you specify the number of audio and video tracks to include in the Tracks panel of the New Sequence dialog box. By default, the dialog box creates three video and three stereo audio tracks for each new sequence, but you can add additional tracks or remove empty, unused ones. In this lesson’s project, the Central Park Coverage sequence has only a single video track. In this part of the lesson, you will add a new video track to the sequence so you can add the trimmed Bystander Interview 01 clip to it. 1 With the pr0301-working.prproj project still open, right-click the Video 1 track in the Timeline and choose Add Tracks from the menu that appears. You must right-click an empty area of the Timeline to open the context menu. 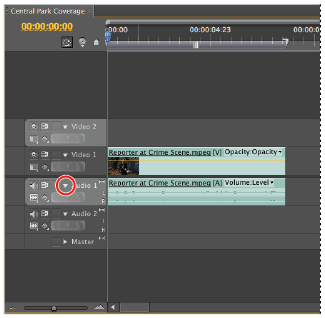 2 In the Video Tracks section of the Add Tracks dialog box, set the Video Tracks to add to 1; in the Audio Tracks section, set the number of audio tracks to add to 1. The third section allows you to add a video sub mix track to the Timeline. By default, you should set it to 0. You can specify where the new video and audio tracks are placed in relation to the current tracks on the Timeline. Confirm that the new video track is placed after Video 1 and the new audio track is placed after Audio 1. Confirm also that the new audio track is a stereo track. mix tracks to your Timeline. To delete tracks, right-click a current track and choose Delete Tracks. In the dialog box that appears, choose whether to delete Audio and Video tracks by name or remove all empty audio and video tracks. Remember that the sequence needs at least one of each track type at all times; you cannot remove a track if it is the last of its kind left on the Timeline. 3 With the Timeline panel active, click the Collapse-Expand Track triangle located to the left of the track name for Video 2. This expands the track’s height to match that of Video 1.
between a collapsed and expanded position. 4 Choose File > Save or press Control + S (Windows) or Command + S (Mac OS) to save these changes to your project. Do not close this file; you will need it in the next part of the lesson. By default, Premiere Pro names tracks in a linear manner. Video 1, Video2, Audio 1, Audio 2, etc. You can change the names to more easily identify which tracks hold specific types of content. 1 With the pr0301-working.prproj project still open and the Timeline panel active, right-click Video 1 track and choose Rename from the menu that appears. Change the default name to A-Roll and press the Enter (Windows) or Return (Mac OS) key on your keyboard to exit the text editing mode. 2 Right-click the Video 2 track that you created in the previous exercise and again choose Rename from the menu that appears. Change the default name to B-Roll and press the Enter (Windows) or Return (Mac OS) key on your keyboard to exit the text editing mode. 3 Repeat this process for both audio tracks, renaming Audio 1 to A-Roll and Audio 2 to B-Roll.